Whether or not David Cameron knew what he was letting himself in for when he appeared as a guest on The Late Show with David Letterman in 2012 is anyone’s guess. As anyone who watched the interview or subsequently read about it will know, there was at least one topic of conversation that he was not expecting to come up. Letterman was keen to see if he could embarrass his guest by quizzing him on the history of the country of which he was Prime Minister, and much to the delight of the audience, he succeeded. When asked what the Latin name of the most famous document in British history – the ‘Magna Carta’ – meant in English, Mr Cameron could not muster an answer. Probably better than his lousy guess at who composed ‘Rule Britannia’ (“Edward Elgar”), but enough for many people in Britain to let out a great sigh, or to mumble something mocking about his Eton education. To be fair to the PM, he did know the year that the ‘Great Charter’ was signed (1215) and the location (Runnymede, by the river Thames), and was able to explain what it was and why it was significant (“It sowed the seeds of democracy… [it’s about] people having rights … about the crown not being able to just ride rough-shot over everybody“). After listening to Letterman’s cheap-shot jokes about the British Empire not exactly being a force for good, how wonderful it would have been if Cameron had been sharp enough to point out to Letterman that it was Magna Carta that helped both create America, and define what it was – and still is – to be American, since it was the inspiration for both the American Declaration of Independence and the Bill of Rights. If only. I wonder whether or not Mr Cameron or Mr Letterman will be paying a visit to the British Library’s Magna Carta: Law, Liberty, Legacy exhibition in the Magna Carta’s 800th anniversary year. Indeed, they would be wise to do so, as would anyone with only a sketchy grasp of its story. Even for those who profess no knowledge of the subject, the exhibition does a tremendous job of explaining what the Magna Carta was, what brought it about in the first place, how it shaped the history of Britain and much of the wider world, and why the principles that were written out on sheepskin parchment eight centuries ago still matter today. And for the real history buff, who considers themself an expert on Magna Carta, there is a whole banquet of fascinating manuscripts for them to feast on. Some are pretty famous, like a handwritten draft of the American declaration of independence in Thomas Jefferson’s own hand (displayed in Britain for the first time), the papal bull in which Innocent III emphatically declared Magna Carta null and void, and two original copies of the Magna Carta itself. But then there are also the equally fascinating documents that are much more obscure, which add yet more intriguing layers to the Magna Carta myth. Take, for instance, the correspondence of British ministers considering presenting an original copy of Magna Carta to the Americans as a gift to help persuade them to enter the second world war, or the very amusing letter written by a member of the government concerned that the proposed ‘Magna Carta day’, to be celebrated across the British Empire, might encourage some of the natives in the colonies to start questioning the mother country’s right to rule over them. The exhibition runs chronologically, with the first section exploring the reign of King John, and examining the events leading up to, and immediately after, the civil war that broke out between the King and his barons. In the next section we move along through the centuries until we get to the colonial era, then hop across the Atlantic to the founding of the United States of America. 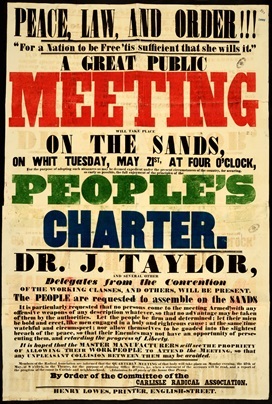 The exhibition’s final sections deal with the Magna Carta in the modern age, both in Britain and abroad, and brings us right up to date with recent controversies surrounding prisoners at Guantanamo Bay and the Prevention of Terrorism Act, made law in Britain in 2005 before being repealed in 2011. The Magna Carta itself – two of four original copies that survive – is left until the very end, which serves as a nice way of bringing us full circle. Much as you’d probably expect from the British Library, and as I have experienced in the past with their exhibitions, the vast majority of the artefacts consist of some kind of text, and so a large amount of reading is required to really appreciate or connect with any of the items on display. Even the completely incomprehensible medieval manuscripts that dominate the first section, written in either Latin or Anglo-Norman French, have their most important or relevant passages highlighted on an accompanying display alongside a translation. Which, along with the detailed explanations of their significance to the Magna Carta story, serve as a great way to allow visitors to engage with all this mysterious old writing. But, all in all, it amounts to a hell of a lot of reading, which brings me to the only possible criticism I can make of this marvellous exhibition, which is that it is all rather exhausting by the end. Thankfully, there are breaks in between the reading, in the shape of short interview segments playing on television screens that provide a wonderfully concise summing-up of the themes and ideas explored in each section of the exhibition. Among the various law, politics and medieval history academics, we get to hear the thoughts of William Hague, Bill Clinton, and Burmese opposition leader (and former political prisoner) Aung San Suu Kyi. Just as I discovered with 2013’s Propaganda: Power & Persuasion, these little interviews provided the exhibition’s most interesting and informative insights of all, and I urge visitors to take the time to stop and listen to them. Along with all the parchments, pamphlets and papers, there are also some beautiful ‘scene-setting’ artefacts on loan from other museums. Most of them seem concentrated in the first section of the exhibition, such as one of King John’s ornately decorated ivory hunting horns, a beautifully illustrated Plantagenet family tree (emphasising the dynasty’s both Norman and Saxon ancestry), and some curious little objects called tally sticks, that were used by creditors to record payments made to them. There’s even two of King John’s teeth on display, recovered from his tomb in Worcester Cathedral in the nineteenth century. One of the most remarkable things about Magna Carta is how close it came to having no impact whatsoever. In fact, a least to begin with, it made no impact whatsoever. The peace that it was designed to bring about between King John and his rebellious barons, who had forced John’s hand by capturing London and threatening to back an invasion by crown prince Louis of France, lasted barely a few weeks. Prince Louis landed in Kent in May 1216 and had half of the country under his control within a few months. Meanwhile the Pope, clearly horrified with the notion of an anointed sovereign having his power kept in check by a group of nobles, and having his divine authority undermined, declared the Magna Carta null and void. His papal bull, an original copy of which is on display (complete with the papal seal attached, which gave the ‘bulls’ their name), did not mince its words. 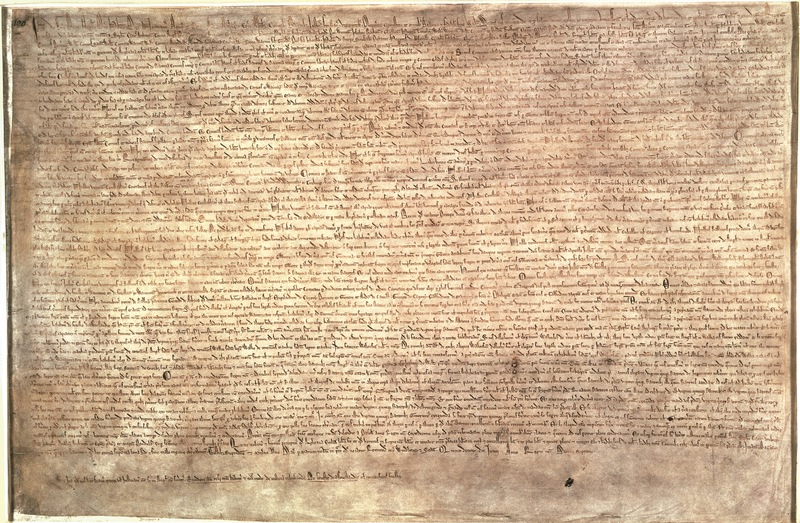 ‘King John was forced to accept an agreement which is not only shameful and demeaning but also illegal and unjust…We declare the charter to be null, and void of all validity for ever.’ But in a curious twist of fate, Magna Carta was prevented from becoming a historical footnote by the sudden death of King John in 1216, and the succession of his nine-year-old son as Henry III. 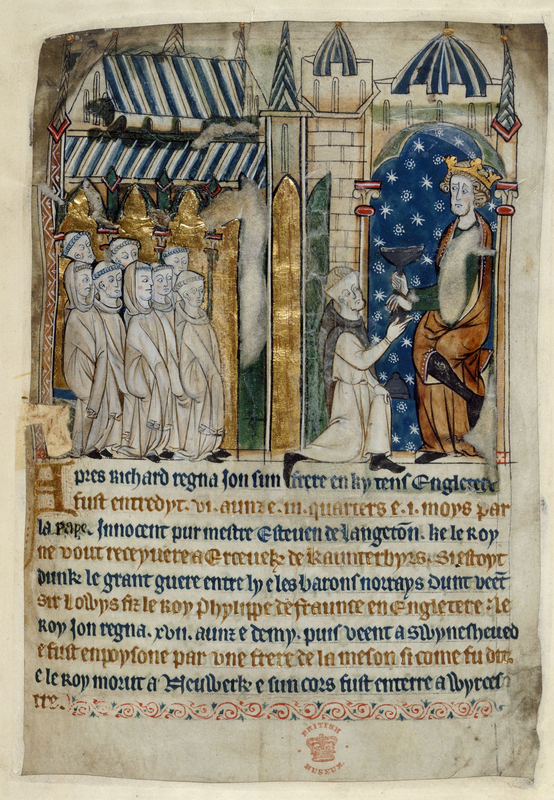 With his kingdom torn apart by civil war, and a French king in London, young Henry knew he now needed all the help he could get, and by agreeing to a new draft of Magna Carta he ensured the support of the vast majority of his nobles. Louis renounced his claim to the English throne, and Henry III put his seal on a new, updated Magna Carta. Unlike his father, this king had done so willingly, not under duress. And unlike the 2015 version, the 1225 version became enshrined in law. Three of its twenty-seven clauses remain part of English law to this day. And by declaring that the King could not impose taxes on his subjects without the blessing of the barons, Magna Carta ensured that regular meetings would have to take place between them, effectively laying the foundation stone of the English parliament that would take shape over the course of the 13th century. It is curious that Magna Carta does not feature at all in Shakespeare’s King John, especially given how villainous John is portrayed in his play. It is an illustration of how, during the Tudor period, Magna Carta and the story behind it was not especially famous, unknown perhaps to those outside of the political elite. This despite its first printed edition appearing 1508, and its first ever publishing in English in 1534 (the same year that Thomas More evoked its first clause, about the king promising to respect the power of the church, in his trail for treason). Its entering into the popular imagination seems to have only truly began in the seventeenth century, during the reigns of the Stuart monarchs. Given the striking parallels between Charles I’s attitude towards monarchial power and that of King John, it is perhaps no surprise that as Charles grew increasingly unpopular with his parliament, Magna Carta began to find its voice again. Specifically, it found its voice in the form of a document published in 1628 by lawyer and writer Sir Edward Coke called the Petition of Right. This hugely influential text, that boldly declared the rights of all English people, marked the point that, as author and human rights lawyer Geoffrey Robertson puts it, Magna Carta “became real.” Although he managed to rise to the rank of Lord Chief Justice, Coke was eventually arrested on orders of the king, and all of his books and writings were confiscated. But by the time the Civil War broke out, various motifs and quotes from both Magna Carta and Coke’s Petition of Right were flying on the banners of parliamentary soldiers. The Petition of Right also strongly influenced the 1689 Bill of Rights, the legislation that brought Britain’s constitutional monarchy into existence and established the principle whereby a king or queen rules only by consent of his or her parliament (ergo, his or her people). At least in as far as its gradual evolution into the laws that now hold sway in Britain and most of the English-speaking world, understanding the significance of Magna Carta is made easy by the exhibition’s neat, chronological narrative. But the exhibition also shows how Magna Carta represents much more than just a historical first-step or pre-cursor. Nicholas Vincent, from the University of East Anglia describes it as ‘A point of principle rather than practical politics,‘ and that it is ‘Magna Carta the idea that matters, not necessarily Magna Carta the political tool.’ Throughout history it has served and continues to serve as a powerful symbol for the rights of the individual, and a slogan for almost any political movement that rallies against a figure of practically any kind authority. From Nelson Mandela to the suffragette movement, the values and the principles that the Magna Carta spelled out – or, at least, people think it spelled out – influenced and inspired all kinds of people fighting for all kinds of rights all over the world, and continues to do so. 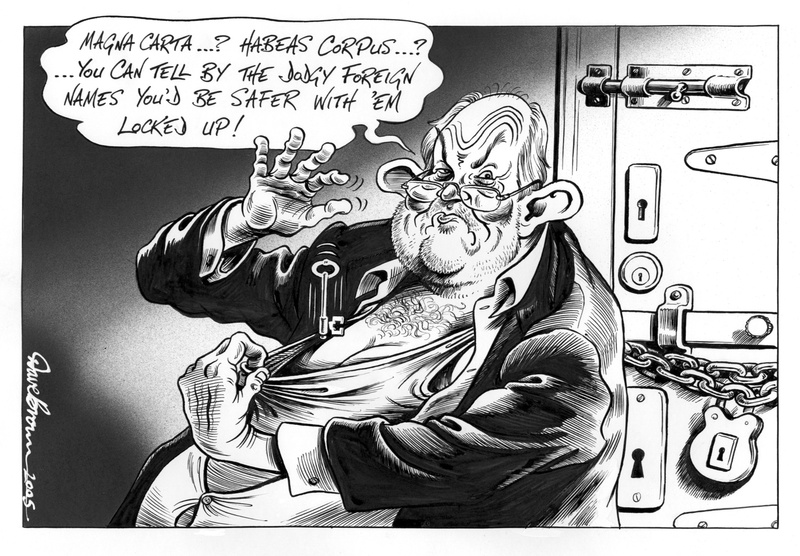 Such is the power of the Magna Carta myth, that I suspect even those in a position of power in the world today who do govern exactly as the please – dishing out justice arbitrarily, detaining prisoners without trial or just oppressing and tyrannising their people in general – would probably never dare admit that they are going against the principles of Magna Carta! Like all myths, the original ‘meaning’ of Magna Carta has been become somewhat twisted and distorted over time, so as to serve different political objectives (those on both sides in the English civil war referenced it on their military banners, for instance). Subsequently, most people have forgotten that almost all of its original clauses dealt with matters of medieval farming, forest management and what to do with vacant abbeys. Those who have evoked it during their struggles for particular rights or freedoms over the centuries have usually neglected to mention the fact that the peace agreement between King John and his barons did not take into account any of the people that made up the vast majority of medieval England’s population, the peasantry. But like former Lord Chief Justice Lord Bingham once said, ‘the significance of Magna Carta lay not only in what it actually said, but in what later generations claimed and believed it had said‘. Whatever the actual clauses of the Magna Carta actually were, the very fact that it stated that the king was not above the law, and had to abide by it just like everybody else, was hugely significant. David Cameron was right. The principle that a person in power must have their power kept in check, and that they cannot arbitrarily use and abuse it just as they please, has perhaps the strongest resonance of all. Is Magna Carta still relevant today? I would argue that, the sheer fact that people have spent the past eight hundred years asking that very question, suggests that it is. Magna Carta: Law, Liberty, Legacy runs at the British Library until 1 September 2015. Tickets cost £12 for adults, with a number of concessions available (book here). Tags: 13th century, 17th century, American, Aung San Suu Kyi, barons, Bill Clinton, Bill of Rights, Britain, British Empire, British Library, British monarchy, Charles I, Charterist, David Cameron, David Letterman, Declaration of Independence, empire, English, English civil war, exhibition london 2015, exhibition reviews london, exhibitions london, France, George III, Henry III, James II, John Lilburne, king, King John, latin, law, London, Lord Bingham, Magna Carta, Magna Carta British Library review, Magna Carta exhibition review, Magna Carta Law Liberty Legacy review, papal bull, parliament, Petition of Right, Pope, power, Shakespeare, Sir Edward Coke, Thomas Jefferson, Thomas More, Tudor, United States of America, war, William Hague, World War Two. Bookmark the permalink. Brilliant piece. I can’t wait to see this exhibition. Did you see David Starkey’s prog on Magna Carta. It’s still on i-player, and worth a view for the parting shot, I thought. I did, shortly before I went to the exhibition. Informative, thought-provoking, and topical. Everyone should see it! Thank you for this thoughtful piece. As an American schoolchild I was taught that the Magna Carta “laid the foundation for democracy.” And there was something vague said about King John, and that was about it. But as I’ve learned more recently, the interpretation of it over the ages, and the lives of its varying clauses—some more enduring and some more important than others—is incredibly complex. The quote from Bingham sums it up nicely. I wish I could see that exhibit. If you haven’t read it already, you would probably enjoy the article in the April 23 issue of LRB by Ferdinand Mount, reviewing several books on the subject. Even if Cameron didn’t know what it meant, he could have guessed. the exhibition is really great, Magna Carta is yet another accident by the English that went rather well. D.C. Nesbitt’s excellent review of the Magna Carta exhibition takes my brief coverage full circle: from last-minute insertion on the charter to introduce observations and prophetical points on the general election results to this re-blog’s opening reference to David Cameron’s opinion in 2012. Also, I endorse the reader’s recommendation to watch David Starkey’s programme on iPlayer. Maybe Barack Obama should read the Magna Carta. Wow. Thank you for writing such a thoughtful piece. I am working with the theme of Magna Carta in a fictional universe and this piece was excellent and provided me with previously unknown tidbits of information. I wish I could go see this exhibition! I wonder how the MC played in the War of 1812? Really interesting piece, thank you! Have you seen the (by contrast) tiny exhibition on the Putney Debates at St Mary’s Church Putney? if not, I think you’d enjoy it. And do call in at the attached cafe next door.